The trigger for the present work on the concept of silence was an article in “Advanced Expert” about Foley artists, sound artists that mimic the actual sound sources of films in a recording studio. The text was packed full of verbs that describe sounds and actions, the exact meaning of which can be understood only by listening to and producing the actual sounds or doing the actions that cause them. For want of a “film” Foley session, we organised a “story telling” Foley session. 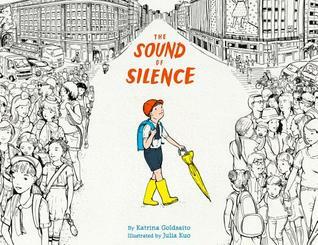 The story chosen was “The Sound of Silence” by Katrina Goldsaito. As a first step, pages of the story were handed out to pairs of students in random order. After reading them carefully and deciding what part of the story their bits belonged to (beginning, middle or ending) they interacted with their classmates in an attempt to put the story together, which they succeeded in doing although not without effort! Once the story had been rebuilt, in pairs they focused on their bits of the story and thought of the sounds and noises that would illustrate those scenes. After some rehearsal, which involved one student reading and the other one providing the background noise or sound, they were ready to record the session. After the session, the class reflected on the Japanese concept of ma, the silence in the spaces between sounds, and on the title of the story “The Sound of Silence”, which reminded some of the students of the song by Simon and Garfunkel. Constanza and Agustín, who had already delighted us with their musical skills, played the song “The Sound of Silence” for us. Following their amazing performance, we proceeded to analyze the lyrics of the song. The class arrived at the conclusion that the concept of silence in the song contrasts strikingly with that of ma, the Japanese concept. To get the essence of the song, groups of students analysed different stanzas and summarised each of them with the feeling they inspired. Very interesting project!! Congrats to all of you! !